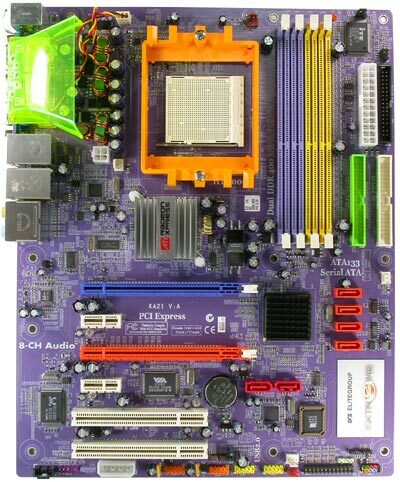 ECS KA1 MVP is an AMD Socket 939 motherboard with the Radeon Xpress 200 CrossFire chipset from Elite Computer Systems (ECS). It supports Athlon 64 / Athlon FX / Athlon 64 X2 processors and has lots of features including PCI Express, SATA II, SATA Raid, 64-bit support, Dual Core, Dual DDR-400, HT 2000, Dual LAN, 8-channel audio and etc, and nonetheless, it’s a colorful motherboard. Virtual-Hideout reviewed ECA KA1-MVP Crossfire motherboard and concluded that the ECS KA1 MVP is a rock solid board with great stability. Once the software was installed the CrossFire feature performed flawlessly… as it should. Overclocking is not this board’s strong point, due to the lack of voltage selections. It’s also loaded with some extras like Cat5 cable and a manual with colorful pictures to match the colorful motherboard, which is pretty nice. But those damn LEDs for the PCI health: not only aren’t they needed, but I think they were just put there to add even more color to this motherboard. Needless to say, they can be very annoying. But the good thing is that the LED’s are supposed to be adjustable…I just couldn’t figure out how to do it. So, if you’re up for the challenge, the ECS KA1 MVP is an excellent choice to experience the latest in ATI CrossFire technology.